The new PWB-320XL is an economical large open wall box designed to fit 16” vertically and 24” horizontally on center stud bays, simplifying AV and IT installations by providing space for routing cables, AC connections, and digital media products mounting in 3” or 4” thick walls. Integrated into each back box is flush cable-tie mounts that can be bent out when needed but lay flat when not in use to prevent interfering with equipment mounting. The PWB-320XL has up to 2” KO’s, flush cable-tie mounts, 4 triple play mounting solution openings for AC/AV/IT applications and three optional adjustable locking shelves for mounting equipment. There are also optional 2 unit/3 unit/4 unit internal AC power brackets that ship with SpikeShield™ 15-amp receptacles. These infrastructure solutions are available in sizes to fit typical wall designs and can be used with or without the decorative trim ring and cover options. These wall boxes are punched in four locations with FSR’s Triple Play Mounting Solution which provides three different options for mounting conduit, cabling, plates, and back boxes to our wall boxes. The PWB-320XL Wall Box is a longer version of the PWB-320 Wall Box. 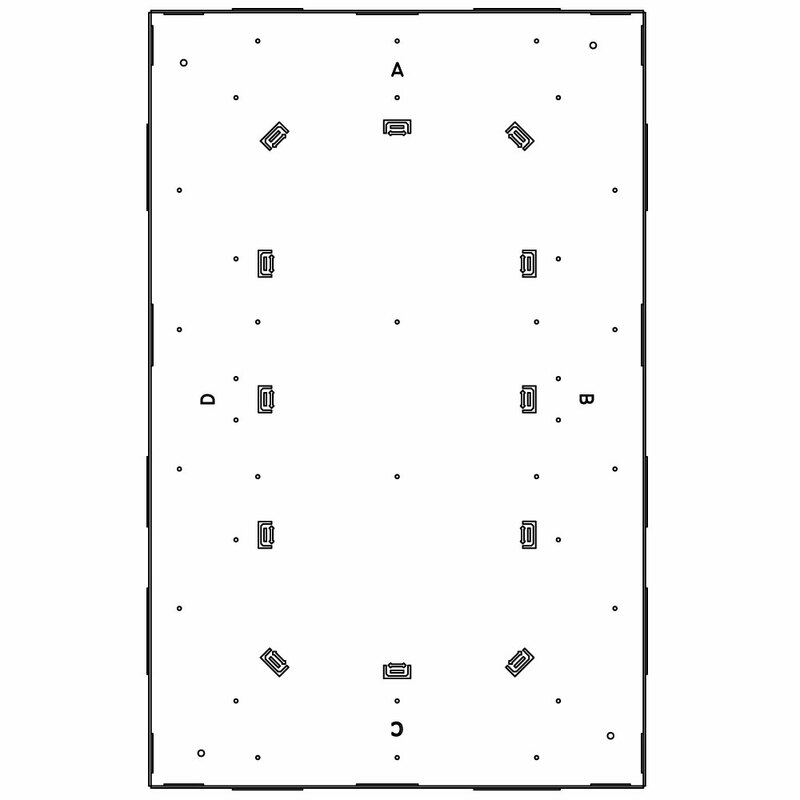 These boxes are designed to fit 16” or 24” on center stud bays. AV and IT installations are simplified by providing ample space for routing cables, AC connections, and digital media product mounting in 4” thick walls. The PWB-320XL has up to 2” KO’s and include flush cable-tie mounts, 4 triple play mounting solution openings for AC/AV/IT applications and three optional adjustable locking shelves for mounting equipment. There are also three optional internal AC brackets available with 2, 3 or 4 Decora openings that include SpikeShield™ 15-amp receptacles. These infrastructure solutions can be installed with or without the decorative trim ring and cover options which are sold separately. The PWB-320XL-TRK kit includes the 4" extra large back box that has up to 2” KO’s and include flush cable-tie mounts, 4 triple play mounting solution openings for AC/AV/IT applications and three optional adjustable locking shelves for mounting equipment. Plus a powder coated trim ring for dressing the dry-wall opening. This rounded trim ring provides a generous 7/8” overlap. The PWB-320XL-ESK kit includes the 4" extra large back box that has up to 2” KO’s and include flush cable-tie mounts, 4 triple play mounting solution openings for AC/AV/IT applications and three optional adjustable locking shelves for mounting equipment. 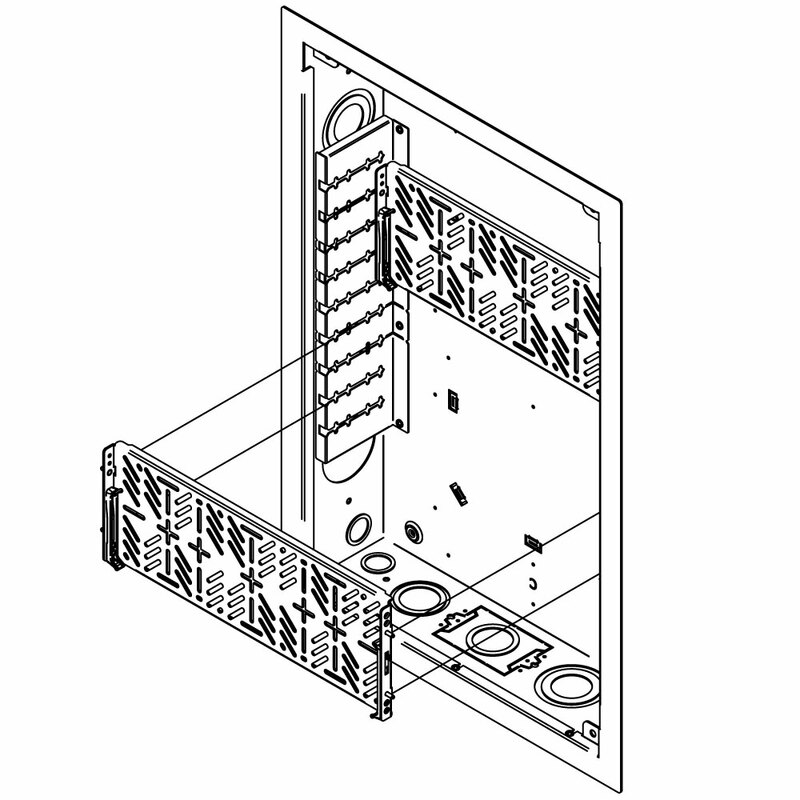 Also an internal shelving system that has two adjustable shelves include a hole pattern that allows for any screw spacing from 3/8” to 11¾” including multiple VESA 100 hole pattern locations. Optional Trim Ring sold separately unless PWB-320XL-TrK is purchased. The PWB-320XL-CV is an optional powder coated cover with rounded cable exits. The vented cover mounts to the trim ring with four tool-less snap fasteners to allow quick access to the equipment inside. Optional internal AC bracket with 2 Decora SpikeShield 15 Amp Receptacles - Ordered Separately. Optional internal AC Bracket with 3 Decora SpikeShield 15 Amp Receptacle - Ordered Separately. Optional internal AC Bracket with 4 Decora SpikeShield 15 Amp Receptacle - Ordered Separately. Shelving location and depth can be adjusted as well as mounted in horizontal or vertical orientation.